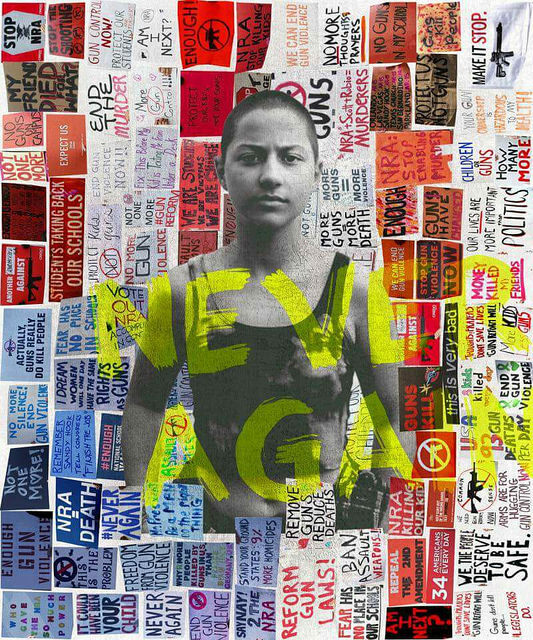 Emma Gonzalez with mosaic of slogans (art by Serena May Illescas) uploaded by Flickr user Vince Reinhart, shared under a CC-BY 2.0 license. It is hard for me to write that only the most recent events at Marjory Stoneman Douglas High School in Parkland, Florida have inspired this post. We’ve been inundated with stories of gun violence in and out of schools far longer than we care to admit. I was in elementary school when the Columbine massacre took place. Even in relative safety, I grew up learning to regard gun violence in schools not as incidents isolated by time and space, but as looming threats that would eventually happen to me or someone I knew. Now, as a school librarian, I feel favorably positioned to approach the work of compiling resources for general and practical support in the current unfolding of violent events. We sit in a favorable seat because of our roles, adjacent to students as teachers are, but also as de facto counselors, confidants, advisors, and affective laborers of all stripes. Affective labor is the critical feminist term for work in the service or care of others, either emotionally or physically. It came about as a response to the invisibility of immaterial labor, and has even been explored in the context of academic libraries. You might be wondering, as I have wondered recently, how to broach the interconnected pieces of school shootings with students in a clear-cut way. How might we balance responsible reactions to unthinkable trauma within our training level and expertise? How might we support students in a time of anger, sadness, political fervor, and need? I am reassured by the old refrain, shared often as comfort with me by my own mother, who also happens to be a librarian. We don’t need to have all the answers. We just need to be the connection. Today I want to share some thoughts and resources that have helped me figure out my personal role in the sea change, and I will ask for your help with one small action: consider this the crystallization, the reification of all the emotional, seemingly invisible duties of a school librarian. We’re already tasked with doing more with less, but I hope that the following few tips and resources provide a wide variety of inclusive practices for the toolkit. Moreover, I hope that a dedicated space for support and discussion within our community proves fruitful and restorative. The care of minds and bodies of others, particularly our students, is a borderless, ever-expanding pursuit. We can only do it so well when we’re able to lean on our community for support. Additionally, I’m interested in your resources. I’ve started a public document, which you may notice at the time of posting is still in its nascent phase. Please feel free to contribute books, podcasts, training resources, tech tools, or timely articles. Read on for some ideas about the connections we can make between the prevalence of gun violence, mental health, activism, and diversity & inclusion work.